The Reach For A Dream Foundation continues to touch the lives of so many while celebrating a quarter of a century of wish fulfillment. The journey of Reach For A Dream began 25 years ago when the organisation’s founder, Owen Parnell, read an article about the American Make-A-Wish Foundation in Reader’s Digest magazine. And the idea to inspire hope in children who are fighting a life-threatening illness was born. The first dream ? to ride a pony and a motorcycle was fulfilled on 7 July 1988 for little JC Steinman. Since that first dream 25 years ago Reach For A Dream has fulfilled more than 12 000 dreams and touched the lives of more than 30 000 children through its projects and outings. Over the years the organisation has gone from strength to strength, opening seven branches across the country, with a head office in Johannesburg. 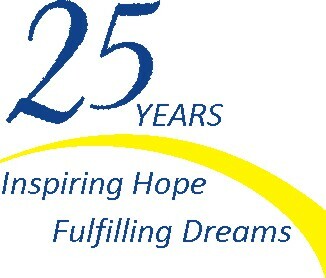 This July, to celebrate 25 years of fulfilling dreams and special projects for children in hospitals and homes across South Africa, the Reach For A Dream Foundation will be hosting many special events for children and their families. Go to reachforadream.org.za for more information.